Clear a path for the Unstoppable Hulk as he makes his way in this Fast Forces 6-Pack just in time for the holiday! 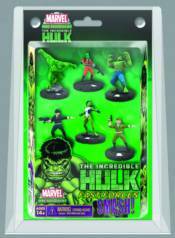 The Incredible Hulk Fast Forces features the very first HeroClix Online Code Insert, exclusively available in retail stores! Each code unlocks free merchandise on HeroClix Online, creating an easy way to connect with friends online and play HeroClix games on a virtual playing field! The 6 pack also features 6 Completely Redialed figures from the base set, 2 themed dice, 1 double-sided map, and 1 rules insert! Fast Forces are ideal for new and experienced HeroClix players. Each Fast Forces 6-Pack comes with a Map, dice, and 6 figures (with never before seen dials, powers and abilities) that can be used to form numerous HeroClix teams.